Kern County agriculture plays a huge role in the California economy and has for many years—not much has changed. PHOTO BY KRISTY GONZALEZ Bakersfield's downtown farmer's market every Saturday morning offers a fresh variety of fruits, vegetables, and homemade goods like honey, jam, pastries, and soap. Kern farmers harvest just about everything—from corn, apples, oranges and grapes to nuts, alfalfa and cotton to flowers and Christmas trees. 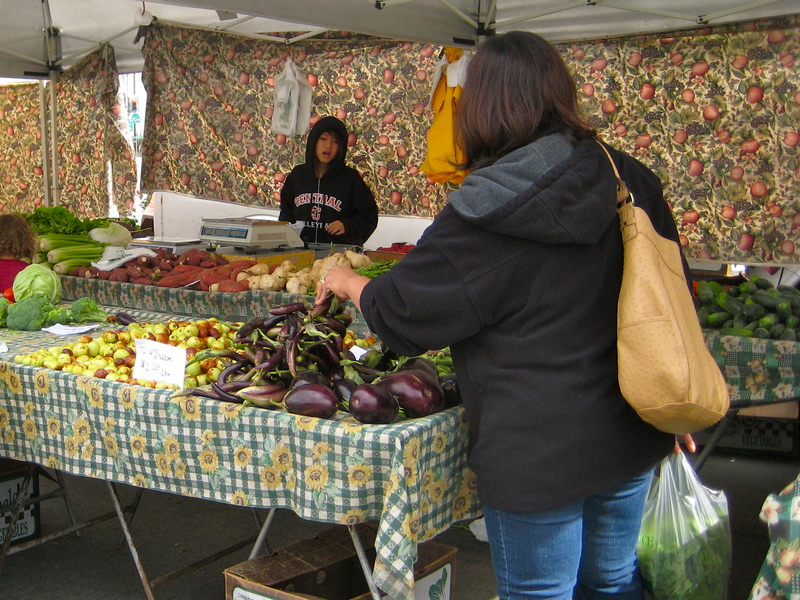 The variety of goods that Kern County produces for the local community, as well as the world, is second to none. However, along with the good must come the bad. Agriculture in Kern has created irreversible damage to the environment and to its people. Some of the major problems with pesticide usage in Kern County are groundwater contamination, the overspray from air application, and accidental contact with ground application. Farm communities outside of the county seat of Bakersfield are usually the most affected. ately 30 minutes north of Bakersfield. Between 1975 and 1989, 13 children were diagnosed with cancer in McFarland. According to the Los Angeles Times, back then McFarland had a population of approximately 6,200 making this one of the most notorious cancer clusters in California. Some McFarland residents believe groundwater contamination from agricultural runoff was what caused the increased cases of cancer in the area. PHOTO BY KRISTY GONZALEZ Almost the entire population of McFarland and Delano rely on bottled water to drink because the tap water is unsafe. Maria Eugenia Allende works a farm laborer and a caretaker in McFarland where she lives with her granddaughter and numerous pets. She has lived there all of her life and claims she still hears about the problems surrounding McFarland’s water supply. “I have heard that the water of McFarland is contaminated. I’ve heard many times to not drink it and to buy bottled water instead, but that gets expensive,” Allende said. Allende works two jobs to provide for her small family. 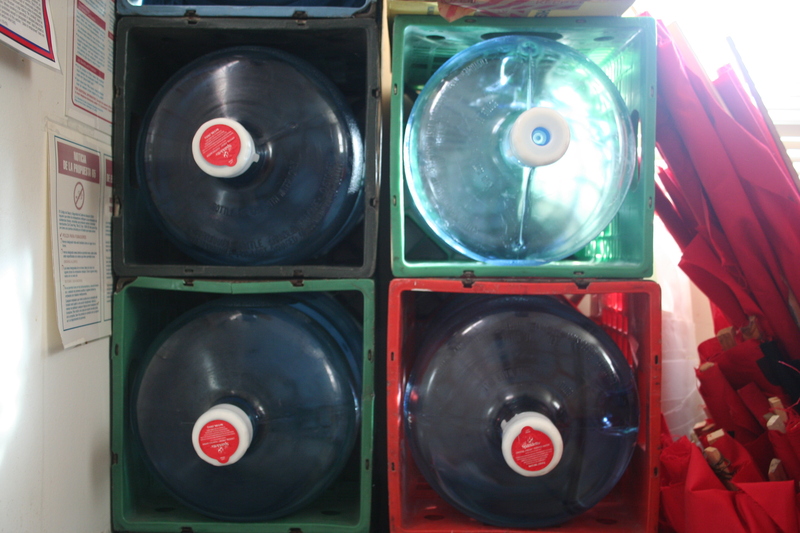 She is forced to buy a bottled water dispenser in fear that the water from her home is contaminated. One of the biggest concerns for parents in the Kern communities is the proximity of pesticide applications to school zones. “In McFarland, there are fields right next to the schools. When pesticides are sprayed by planes the wind carries the chemicals. It puts the kids in danger, as well as the rest of us,” Allende said. Allende’s 8-year-old granddaughter Jacky Allende attends Browning Road School in McFarland. Agricultural farmland that varies its produce seasonally shares the same plot of land with the school. Across the road sits yet another field—almond orchards. Children living and playing in areas of toxic chemical usage is frightening for most to think about. For children in McFarland, it’s the norm. For those that work in the fields, it’s nothing new. Pesticides have been harming farm workers for years. Even with several laws and regulations in place to decrease human interaction with recently sprayed pesticides, people are still reporting symptoms related to pesticide contact. Juan Carlos immigrated to the United States from Mexico recently and now works as a grape picker for Sun Pacific in Delano. Although he hasn’t personally been affected by ground application of pesticides, he has seen many dead animals after entering recently sprayed fields. “Every time I see a dead animal in the fields I think to myself ‘If the animals are dying from the chemicals, is this really good for us humans?’” Carlos said. The United Farm Workers of America (UFW) organizes farm workers into a union to face injustices like low wages, the lack of water and restroom facilities, long workdays, and pesticides. tional Farm Workers Association) in Kern County in the early 1960s. The UFW has had many successes since it’s beginning, but the union is still challenged by injustices in the agricultural communities across the nation. Kern County is home to the UFW headquarters called “La Paz” or “Peace” in Keene, as well as the farm worker safe haven “Forty Acres” in Delano. PHOTO BY KRISTY GONZALEZ Nancy Oropeza hands out face masks to farm workers so they are somewhat protected from inhaling harmful chemicals while working in the fields. 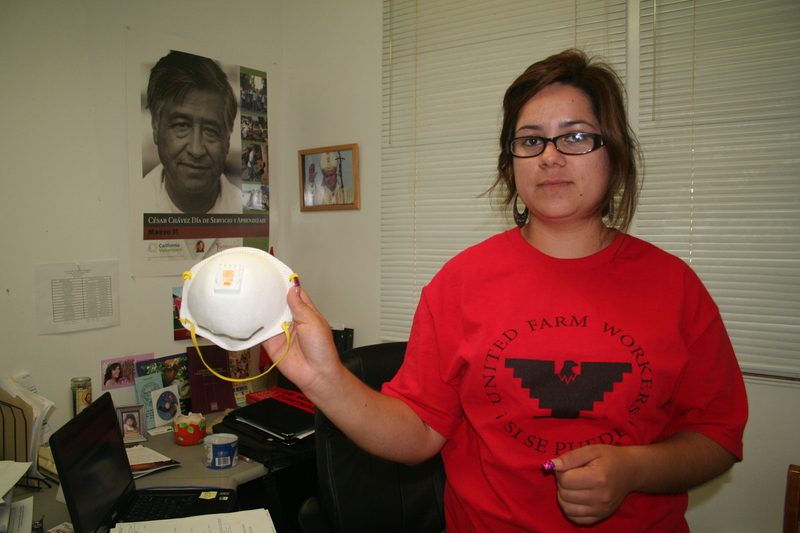 Nancy Oropeza is a Kern County native and works for the UFW as an organizer. She started volunteering in 2006 for the UFW after an incident in Arvin where pesticide overspray from a nearby air application soaked school children waiting at the bus stop. Oropeza’s involvement with the UFW is her way of giving back to Kern’s people. “From 2006 to this day my goal is to do everything in my power to inform farm laborers of their rights and to make sure their voices are heard in the community,” she said. Oropeza helps not only those affected by pesticides, but also those dealing with other injustices like low wages, worker-related injuries, mistreatment of farm workers. Sí se puede, but when? Change in agriculture, especially in California where the industry keeps the economy going, is not as simple as it sounds. 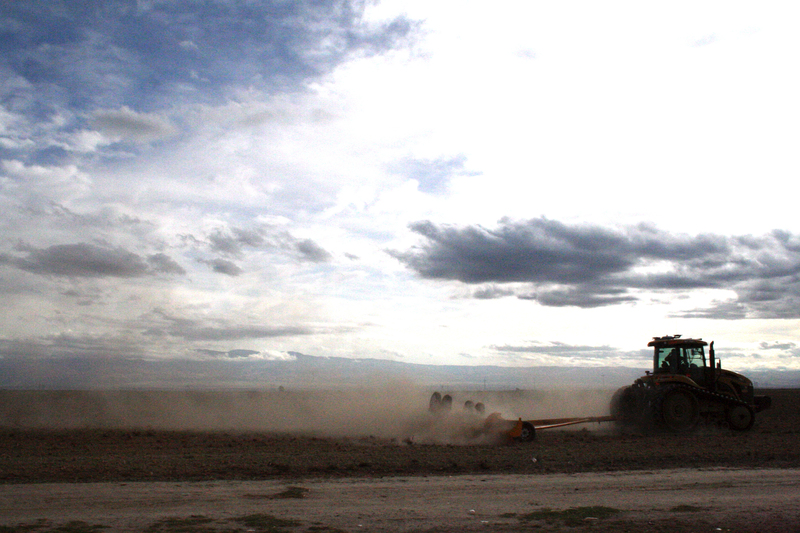 PHOTO BY KRISTY GONZALEZ Tilling stirs up pollutants and dust in the air that Kern County citizens breathe. IPM aims to reduce the usage of tilling. Dr. David Headrick heads the California Polytechnic State University (Cal Poly) Organic Farm and also teaches etymology there. “The change is always viewed as the regulations and the regulators. [Regulation] is probably the worst word in California agriculture right now—everybody hates it. But for good or for bad, it is the stimulus for getting people to change,” Headrick said. His specialty is Integrated Pest Management (IPM) system, a type of farming which aims to reduce the harm to the environment and people. IPM avoids tillage, harsh chemicals, and fossil fuel usage, among other things to maintain a more sustainable environment. Headrick believes that we will only see progress if the current agricultural industry adopts new ways of operating that are less harmful to the environment and most importantly, the people.